Esha Momeni, women’s rights advocate and a member of the Campaign from California was arrested on Wednesday October 15, 2008, while on a visit to Tehran. Momeni who is a photographer and graduate student was arrested in an unusual and illegal manner after being pulled over on Moddaress highway, by individuals who identified themselves as under cover traffic police on the pretense that she had unlawfully passed another vehicle while driving. 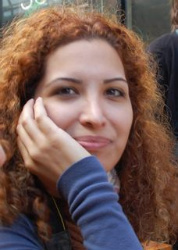 Esha was arrested and taken to Section 209 of Evin Prison, managed by the Intelligence and Security Ministry. 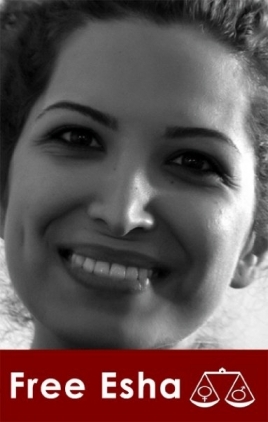 Prior to her transfer to Evin, security officials searched her home and seized property, including her computer and films which were part of her thesis project. The security officials had an arrest warrant and court permission to search the home and seize property. While Esha’s friends and colleagues were insistent about announcing the news of her arrest immediately, based on requests from her family this news was announced with delay. Security forces had promised Esha’s family that she would be released quickly if news of her arrest was not published. Esha’s parents went to the Revolutionary Courts today, on the fifth day of her arrest, to follow up on the case of their daughter. Court officials told the Momeni family that they should not come to the courts again, and that their questions will not be answered until the investigation of Esha’s case comes to a close. Esha Momeni is a graduate student at the School of Communications, Media and Arts at California State University, Northridge. Esha had come to Iran two months ago to visit with her family and to work on her Masters thesis project, focused on the Iranian women’s movement. To this end, she had conducted video interviews with members of the One Million Signatures Campaign in Tehran. Women’s rights activists object to the unusual manner in which Esha was arrested, as well as the irresponsible treatment of her family members by security forces. Further they strongly object to the unjustified and unwarranted arrest of this women’s rights defender. A weblog in support of Esha pressing for her release has been established, which includes interviews with her professors… . The weblog as well as the site of the Campaign, Change for Equality, will continue to provide news on developments about Esha’s case. Take a look at the blog For Esha. * Ambassador Mr. Ahani, Embassy of Iran in Brussels, avenue Franklin Roosevelt, 15 A. 1050 Bruxelles, Belgium, Fax: + 32 2 762 39 15. Email: iran-embassy@yahoo.com. h/t Vanessa @ Feministing (via Feminist Daily News); more from CNN, DKos, Melissa Wall, and David Blumenkrantz. Also see this article on the 0ne Million Signatures Campaign, written by Momeni in 2007. Background: More on the still-ongoing One Million Signatures Campaign for Equality from Change For Equality (more here) and Ms. Magazine. If you haven’t done so already, be sure to add your name. Esha should be released immediately and unconditionally. As per Prophet Mohamed, women should be given equal rights. Thats why he instituted property rights for them. Esha was also fighting for the same. So her arrest is against Islamic priciples.